Aqui ficam finalmente as instruções, receita, pattern desta amigurumizinha. 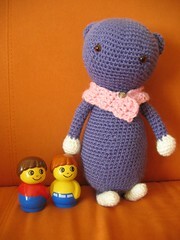 Two colours of yarn, 4mm crochet hook, 2 safety eyes. Make a loop from the yarn. With one colour, make a loop with the yarn. For the "scarf", I just did some rows of 5st of dc, at the end I just sew an old button and crossed it. Stuff your friend, sew all parts together and give her a name!